Today’s Site of the Day, Mentos Kiss, ties together two interactive sites, the Mentos Kiss Cam, and the Mentos Kiss Fight, and is supported by a number of interactive banner advertisements and online films. Pefetti Van Melle has been aligning the Mentos mint with intimacy in a range of online Mentos-powered kissing experiences. It’s a celebration of extraordinary kissing, the kind of kissing you can only perform if you chew cool, fresh Mentos gum and candy. “There’s nothing like a Mentos kiss”. With a web cam visitors to the Mentos Kiss Cam site can interact with a woman with a wet bathing suit (a homage to Ursula Andress James Bond) or a man in white riding on a white horse. Feed them with a Mentos mint and they’ll be keen to try kissing your screen. Hold your face (or hand) close enough to the camera long enough and they’ll kiss themselves silly. The Jazz Club banner, winner of a Silver prize at the London International Awards 2008, uses a Mentos to transform a quiet restaurant dinner into a swinging evening in the Jazz Club. Viewers are able to play along on the saxophone, though the notes A, S, D, F, G, H and J were clearly not chosen by a musician. See the Jazz Club demo online. The Clock provides downloadable mobile phone applications, demonstrating a kiss that goes around the clock. The Long Kiss uses a Mentos to make kissing, biting and licking last longer. The laundrette uses the Mentos to put some spin into kissing. The Blow Kiss features the woman from the Kiss Cam site interfering with the page. This Mentos Kiss Fight site is designed with the guys in mind. Nicky Fresh Lips must battle through three levels of female opponents: Ti Ni Pout in the cinema, Mandy Makeout in the gym, and Derek’s mom in the dorm room. The idea is to provide the woman with more pleasure than she gives you by dodging, kissing and adding the Mentos bonus. The Mentos Kiss campaign was developed at BBH London by creative director Dominic Goldman, copywriters/art directors Hugo Bierschenk and Dean Woodhouse. The Kiss Cam site was developed by Perfect Fools, Stockholm. 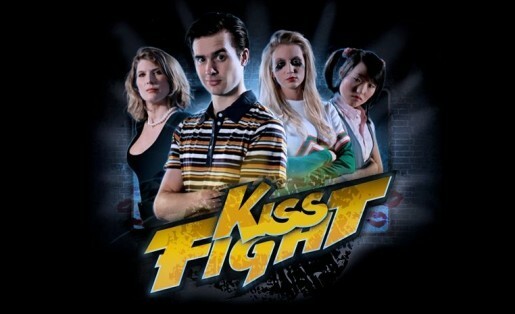 The Kiss Fight site was developed at North Kingdom, also based in Sweden.